For our next show the choir I sing in is rehearsing a number of new songs for which we have commissioned bespoke arrangements. One of them is Jacques Brel’s Carousel, aka La Valse à Mille Temps, with English words by Eric Blau. We will always remember these. To be honest, these lyrics are somewhat opaque to British ears. In BrE we would speak of funfairs rather than carnivals, candy floss rather than cotton candy, roundabouts rather than carousels, and steam organs rather than calliopes. Because we’re not familiar with the word calliope, we also don’t know how to pronounce it. The chorus’s assistant musical director has made rehearsal tracks of the music for us (tenor 1, tenor 2, baritone, bass) — an excellent thing to do, and very time-consuming for him, but something which makes all the difference for those of us trying to learn our parts despite shaky sight-reading skills. He pronounces kæliˈəʊpeɪz. 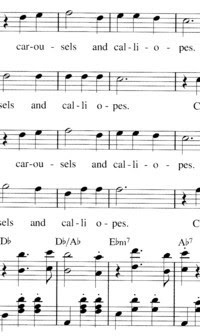 I have been researching the word “calliope”, which features in our new chorus item Carousel. All the dictionaries I can lay my hands on (including my own Longman Pronunciation Dictionary) give the pronunciation as having the stress on the second syllable, -li-, which is like “lie”. The final syllable is like “pea”. In the International Phonetic Alphabet, it is represented as kəˈlaɪəpiː (see the attached scan from the big Oxford English Dictionary). The vowel sounds and the stress placement are comparable to those of the word “variety”. In the lyrics of the song, it is clear that the “-pes” syllable is meant to rhyme with the word “these” at the end of the next line. So if we pronounce it “pays” we are missing that intended rhyme. Obviously, your decision is final for the chorus: we will pronounce the word in whatever way you lay down. But I thought you might like to know these findings. Calliope was, yes, one of the nine Muses, in fact the chief of the Muses, daughter of Zeus and Mnemosyne, mother of Orpheus, and inspirer of Homer. In Greek her name was Καλλιόπη (‘beautiful-voiced’). The -op- part has nothing to do with vision: it represents the noun ὄψ ops ‘voice’, cognate with the ep- of epic. Like other Greek names, this one too passed through Latin on its way to English, thereby becoming subject to the Latin stress rule. Latin stress is sensitive to the weight of the penultimate syllable: since the o is short, stress falls on the preceding i. Being prevocalic, this i has to become long in English. The GVS turns it into the modern diphthong aɪ. Coming upon calliope, Calliope as a written word for the first time, you can’t predict its pronunciation without knowing the classical quantity of the o. There seems to have also been a vulgar AmE pronunciation ˈkælioʊp (perhaps it still exists) — but that wouldn’t fit the music, which requires a four-syllable word. The long [iː] instead of short [ɪ] would strike me as pedantic, provided the speaker actually doesn't pronounce it the same as he would in happy anyway, of course, but the rhyme with these suggests it. As an American, Blau might have had the same -[iː] for calliope and happy. More than likely, but I had assumed that the pedantry (which annoyed me too) was of the Classical quantities variety we recently discussed on Linguism, and that the speaker actually didn't pronounce it the same as he would in happy. I shouldn't say it annoys me much, as long as the amateur Classicist doesn't try to teach me English. kæliˈəʊpeɪz reminds me slightly of Victoria Wood's facetious pronunciation of Spudulike (ˈspʌdjuːlaɪk, the baked potato emporium) as spʊˈduːlɪkeɪ. Also of an anecdote of Robert Robinson's about some classical actor who got a bit carried away and declaimed "Bring on the athletes [ˈæθlɪteɪz]!". Afterwards he confessed "I made a bit of a ˈtestɪkliːz of that, didn't I?" Any speaker for which "Andy's" has a different last vowel from both "and is" *and* from "Andes"? As an American, a phonologist, and a chorister, I can assure you you're right: any American choir would pronounce the word /kəˈlaɪəpiz/ in four syllables and rhyming the final syllable with "these". Yes, anyone with HAPPY in [iː] or [i] rather than [ɪ], for which alternation the use of /i/ (I think originally proposed by JW) is widespread. If JW went in for archiphonemes, he would call this one, as it represents the suspension of the opposition between i: and ɪ. The idea is to reflect the loss of functionality for that opposition in the overall system, and not to arbitrate on idiolectal preferences. Mine for example are ˈændɪz/ænd ɪz~ˈændiːz, and ˈædzɪz for adzes, which is the closest I can get for the purposes of comparison. I think army was asking if "Andy's"~"and is"~"Andes" ever have three different vowels; I don't think you've answered that question. Next: Llama-wool knickers, or, Andy and 'is Andes undies. It's hard to be sure, but I don't believe that AmE-speakers with [ɪ] as the reduced form of [i] use it in Latin-derived words like calliope and alumnae. BTW, if I had encountered such a word without any clue about its etymology or number of syllable, I'd have asked whether it's /ˈkæl i əʊp/ or /kə ˈlaɪ əʊp/, or used one of these two at random. But if I had been told or figured out that it's four syllables, I'd have likely guessed the correct pronunciation, except that in the third syllable I'd have been unsure between GOAT, schwa, free variation between these two, or even LOT. then the answer to army1987 would be "yes". I have something like [ændɪz] for any of dis, but how do you pronounce Los Angeles? I too think army was asking if "Andy's"~"and is"~"Andes" ever have three different vowels, and I did answer that question: they do for "anyone with HAPPY in [iː] or [i] rather than [ɪ]"
I think it does for most NSs. > My question was whether there was someone whose realization of the HAPPY archiphoneme was distinct from both these of FLEECE and KIT. Yes, as I hope my above answer to lipman has made clearer than in my earlier post. It's desperately marginal. People who have "studied"~"studded", "partied"~"parted", "taxis"~"taxes" with əd and əz are quite capable of having the distinction between knitted and nitid, even if I'm not. A three-way distinction (necessarily pretty desperate) that I have come up with would be pitied~pitted~pittid. So it's more a matter of restricted distribution combined with free allomorphy! When I lived in England, I sung in and conducted many choirs (mostly church choirs). We were always taught to use [oʊ] for the GOAT vowel when singing in English, even though we would have used [əʊ] in speech. (This was perhaps for reasons of euphony, or possibly as a remnant of a pre-WWI pronunciation -- I suspect the former). Does your choir use [əʊ] for the GOAT vowel, even in singing? Or is your use of əʊ in describing your asst. musical director's pronunciation merely phonemic? Incidentally, it looks from the excerpt of the musical score given above that the natural waltz rhythm would lead to stress on the first syllable of "calliopes". This made me wonder whether Eric Blau himself would be familiar with the word, but according to his rather amusing Wikipedia entry he was born in Connecticut and lived in New York, so I assume he did know it. My "Snap!" post of 16:29 was addressed to you not lipman, saying I had given the same answer as you to that particular question of army 1987's. lɒs ˈændʒɪˌliːz, and I think it would be either that or lɒs ˈændʒəˌliːz for any BrE native speaker of anything approaching RP, SBE or whatever. So lɒs ˈændʒiˌliːz if you like. I get the impression it is not so easy to say what it is for AmE and points south! Not happy with lɒs ˈændʒiˌliːz on reflection. It would presuppose a laminal palato-alveolar dʒ and a vowel-harmony-type anticipatory i which I don’t think would be that high or front. I should probably have used the lɒs ˈændʒɪˌliːz for that, and lɒs ˈændʒɪ̈ˌliːz for myself, as I have a retroflex dʒ, but I was at the end of my tether with these diacritics. It's like herding cats! But if anyone can herd cats it's JW. John, recent posts have agreed that this is something that seems to happen intermittently on some sites, and that nobody knows which way is up at the moment, either here or on Linguism. I predict from your own posts on this that lɒs ˈændʒɪ̈ˌliːz will look all right to you but all wrong to me and other contributors. And what is the prognosis? Yes, it looks fine to me. I have no idea what to do about these font problems other than to urge people to obtain and install the latest version of Lucida Grande, which is what seems to be blogger's default font and is what my screen displays. How dare anybody attempt to translate Jacques Brel?! In my book, that is an offence which deserves being covered in cold custard. I remember there was some taboo to perform Ne me quitte pas after he died, but translating? But then dictionaries older than a couple decades transcribe "infinity" with four identical wovels. Really? BrE speakers say lɒs ˈændʒɪli:z? I live about four hundred miles to the north of that city, and I believe most Californians say either lɒs ˈændʒələs or lɑs ˈændʒələs when they don't say 'ɛlei. I think ˈændʒəlɪs would be the more carefully-articulated variation. I have also, once or twice, heard residents of Southern California say ˈæŋgəli:z, or something pretty close to that. Andy's and Andes have the same final (FLEECE)vowel in my (Northern California) accent; "and is" is different (KIT). And I would pronounce calliope with the same vowels as variety, including the i: at the end (as in happy). Great! I have no objection to seven identical vowels! Well tried, army, but I would only distinguish two of your "candeed"/"candied"/"candid"/"canded"/"candered". "Candeed" would either be /kænˈdiːd/ or extrasystematic, leaving only "candered" distinct. I had been trying too. See below. I too suppose it was for reasons of euphony that we were always taught to use [oʊ] for the GOAT vowel when singing in English. And the teachers' idea of euphony was to make us a leetle more Italianate. So we are stuck with [əʊ] sounding ludicrous in singing and don't know what real sung English would sound like if it hadn’t been made to sound ludicrous! your post has been decapitated. Can you reattach the severed head or grow another? > /1D7B/ and /ɪ/ (what Wells would call "weak /ɪ/ and strong /ɪ/") are not quite in c.d. Any use, army? That's only a pair for me, I'm afraid! I could distinguish missies, but it's so marginal it's over the edge into extra-systematicity. John W, we have been discussing where we can get this latest version of Lucida Grande of which you speak. It's not even bundled with Safari any more. I've got the latest version of LG I have been able to find after exhaustive enquiries, and am using it both in Word and for Firefox and IE, but barred small capital I [1D7B], and barred Latin upsilon [1D7F] are not in the font, and neither is [1D7E] which you gave Lazar when he asked for barred Latin upsilon. Of course I can't see what that might be. I'm sure there are many other such words that follow this pattern. I am also very interested in the recent submissions from BrE bloggers about [əʊ] vs [oʊ] in singing. On this side of the Atlantic, unless dealing specifically with American repertoire, we normally teach our singers to sing RP vowels _except_ in the GOAT vowel, which should stay with our usual [oʊ]. So it seems we are in agreement here on both sides of the Atlantic. This combination vowel treatment is one of the main features of what many call the "Mid-Atlantic accent." I'd also have only two, ie [ɪ] in the first four and [ə] in the last, unless you talk of a recycling bill known as the Can Deed. John M., I had assumed so. So it seems that there are dialects in which you can't have final unstressed FLEECE, and indeed for both "manatee" and "banshee" Wikitionary also lists the last-stressed pronunciation. I've looked up "bumblebee", but Wikitionary gives no pronunciation; how do you pronounce that? I do hope this has not been such a protracted wrangle that you miss my post of 00.13 this morning about Lucida Grande. > and indeed for both "manatee" and "banshee" Wikitionary also lists the last-stressed pronunciation. I've looked up "bumblebee", but Wikitionary gives no pronunciation; how do you pronounce that? And the second irrelevantly, since it is incompetent: it should have a secondary stress on tiː as they manage to notice for the US, in spite of the non-long vowel. And in that at least I think they are right, for the length is not functional in GA. The secondary stress alone accounts for it. They could have transcribed it [ˈmænəˌtiː]. Furthermore if they did show the secondary stress in their second transcription for BrE, the length would be non-functional there too. Again the secondary stress alone accounts for it, but in slightly different circumstances. And again they could have transcribed it [ˈmænəˌtiː]. For "banshee" OED Online gives only (ˈbænʃiː), again incompetently, brackets and all. Not only should it be marked for the subsidiary stress, but they should list bænˈʃiː first, by my reckoning, the reckoning of most of the dictionaries and sound files for both BrE and AmE, and the reckoning of etymology (sorry). The online Compact OED only gives final stress for it. Huh! For "bumblebee" OED Online actually has two primary stresses, even more incompetently in my view. I agree with Lipman on that, and his point about "candeed", even if it were one word (though not a verb, I'm afraid, army). Like him I would have secondary stress on "bumblebee" and "candeed". The reason for all this is that all these either are, or behave like compounds, and accordingly need to be treated as two phonotagms, which means that the rules for unstressed vowels are irrelevant. Changed to IPA, OED1 has [ˈbænʃiː] and [mænəˈtiː], no alternatives. Why are you so adamant about this? Do you think there can't be unstressed long vowels? It all depends what you mean by unstressed long vowels! Doesn’t it? Even [manəˈtiː] should really have its allegedly unstressed short vowel marked for secondary stress as in the /ˌmanəˈtiː/ I quoted above for the 1989 entry. Are you sure they have actually removed that? If so I can't disagree with it as I was happy with bænˈʃiː in the same post. The strong vowel alone implies some degree of subsidiary stress. Try saying them without it! So if they had still had their manəˈtiː in solidi, that realization could be predicted, but square brackets are not supposed to need realizational rules! The strong vowel alone implies some degree of subsidiary stress. Try saying them without it! I suppose most of us here could, even the improbable minority who don't speak fluent Czech or Hungarian &c. and I don't think it sounds all that awkward. But I might be wrong; my inner-auditory check isn't the same as a solid spectrogram. It may not be a font problem. In situ it appeared -- and still appears with a tilda over the s. However when pasted into the editing box it looks as John intended. And it still looks right in the Preview box. When I posted it in Word the default font couldn't handle it. The two non-ascii vowels were just boxes and the tilde was over the s. However, when I changed the font to Lucida Grande it appeared corrected and correct. The same with Verdana. I received all the information that John sent. It's just that it wasn't displayed right. I didn't mean it's particularly difficult to say them without subsidiary stress. I meant if you try it you will realize it's wrong. It's a matter of descriptive adequacy. The original performance of "We're on a Carousel" can be heard here. That should answer any questions as to how the Blau lyrics were meant to be pronounced. On your link, the sung syllable kal- sounds odd to my old-fashioned English-of-England ears. I know that if I sang it, it would be with a slight syncopation (to avoid stress) and a vowel quality of ə or something intermediate between ə and æ. @Julie: I hear lɒs ˈændʒəlɪs most often, which is how I say it myself. lɑs ˈændʒələs/ɪs does not surprise me, as so many Americans now merge calm-cot-caught. Like you, I have - very rarely - "heard residents of Southern California say ˈæŋgəli:z, or something pretty close to that." I think the only time I've ever heard a non-Brit say lɒs ˈændʒɪli:z it was Arlo Guthrie singing "Coming Into Los Angeles" http://popup.lala.com/popup/360569475237640568 - where he has to rhyme it with "keys" and "please." @David: I would describe the syllable that Elly Stone sings as kʌ, the next one being laɪ. It's very natural. The first syllable is unstressed, and if spoken conversationally, "Calliope" would have ə as the first vowel. Drawn out, it becomes mid-open back ʌ. Many Americans, I'd guess most, say a short ʌ rather than ə in a great number of unstressed syllables, though it tends to become more central as it becomes shorter still, in rapid speech. In my own speech, above is phonetically ʌˈbʌːv unless rapid; then, and only then, is it truly əˈbʌːv. This use of phonemic ə where I have phonetic ʌ used to confuse the heck out of me, and I find it confuses most of my clients; once I discovered that another dialect coach had the same difficulty with it, which made me feel less foolish. In any case, it isn't kal or even ka to me. It certainly isn't kæ, let alone kæl. Do you really say ka in an unstressed syllable? I think you are being led astray by the literary syllabification in the printed lyrics, which has nothing to do with natural spoken syllabification. You can't syncopate it (unless you are Ella Fitzgerald, in which case you can do whatever you like with no interference from me), because Brel didn't write the melody that way. So you have to find some way of making the Blau/Shuman lyrics fit the music as written. I would have pronounced "Calliope" exactly as Elly Stone did, to fit it to the Brel music. @David again: In case I wasn't clear, look at the syllable division in the word "carousels" in the image of the sheet music. Car-ou-sels. If, as I suppose, your speech is non-rhotic, however would you sing that? You haven't got the sound in your phonemic inventory (or "sound house"). Americans can sing kæɚ.ə.sɛɫz. You can't. I wouldn't (aesthetic preference). For you, it has to be kæ.ɹə.sɛɫz, which is also how I would sing it, except that I'd sing l where I say ɫ - but that's my choral training at work. The same applies to "calliopes." Literary division: cal-li-o-pes. Spoken/sung division: ca-li-o-pes, phonetically kʌˈlaɪoˌpiːz - piːz, not piz, because of the sustained note. If spoken, piz, maybe piˑz. In this accent, are [ə] and [ʌ] the same phoneme and unstressed vs stressed variants only? That would explain the occurrence of [ʌ] for [ə] when the syllable is stressed by way of exception, for instance when the tune suggests it. The written syllabification in my post reflected an early classical education. I wasn't sure how the singer on your link had done it. (It was a tricky link to follow, so I've only heard it once). I certainly would sing kæ as an open syllable in 'carousel'. I might well sing kʌ in Calliope -- though I would say something much closer to kə. And I certainly would syncopate (ever so slightly) if I thought it would make my singing sound more like my speech. You don't have to be Ella Fitzgerald to manipulate rhythm. I can see that choir singing would put a damper on that, but my preference is for solo unaccompanied folk song, where fidelity to speech rhythms is essential. @David: All you say makes perfect sense to me. My remark about syncopation and Ella Fitzgerald was not meant to be taken altogether literally (my sense of humor gets me in trouble, especially online). Of course you are right about syncopation in individual performance, but in (most) choir singing (just as you say), and for performance in the show Jacques Brel is Alive and Well and Singing in Paris, though, I'd say syncopation is right out. @Lipman: Many people, at least in US, do indeed consider [ə] and [ʌ] as the same phoneme and unstressed vs stressed variants only. I tend to get unnecessarily militant about the phones, and lose the forest for the trees ... ! My coaching joke: When is a ə not a ə? When it is a ɚ! I call the various phonetic renderings of phoneme ə the Bermuda Triangle of vowels. This makes no sense whatsoever, but my clients always get it. Must be something in the water I give them. Q: Why isn't his grammar rhotic? A: Oh, she was from Suffolk, like his grampar. I think mallamb's point is that there's always a secondary stress there. I'm not sure myself, but as I said, that'd be clearer with spectrograms. Sorry, please forget the -/lo/ on the phonemic level. Lipman, you’ve got it. And you seem to be more sure than you say you are, to judge from your own reported pronunciation of these items, as you mark the secondary stress. Even I wouldn’t normally do that, as I think it is implied by the length! And in the case of "Featherstonehaugh", I note that you put the secondary stress mark in brackets, while making it clear with the ʃ that you intend the pronunciation ˈfænʃɔː. I suspect that army1987 intended ˈfɛðərstənhɔː or something closer to it than that, where the two-phonotagm structure of which I spoke is more obvious, giving of course the long vowel which we by no means deny and the absence of unstressing which I think we would agree in asserting. And I can report the same pronunciation as you for all these items except "yellow", for which I cannot imagine [lo], and am too ˈjæɫə to say ˈjelə. Would you settle for ˈjelə̈? But I would also have strong forms occasionally: ˈsɪnju or even ˈsɪnjuː, and I think at a push ˈmʌnde or even ˈmʌndeɪ. With subsidiary stress, of course! So army, if you can't have final unstressed FLEECE, why *would* you have *any* final unstressed long vowel? First of all, you fooled me into reading your "occasionally:" with a long /iː/. Would you settle for ˈjelə̈? Why not, but I didn't transcribe that all narrowly anyway. But I'm not sure jelə isn't quite widespread unless the whole word is somewhat highlighted. ˈmʌnde: Is that a shortened eɪ or an open ɪ? @Lipman: That's a hoot! Very few of my American clients would get it without my explaining the joke. Conversely, I'm sure the distinction between schwa and schwar would be lost on most speakers of BrE, excepting those from rhotic areas. Is there a typo in your last word to me? What is meant to be? > you fooled me into reading your "occasionally:" with a long /iː/. b) it fell foul of the ambiguity that even the most ambiguity-aware of us don’t foresee: I meant would you settle for _me_ saying that, not for saying it yourself. c) it's too arcane in any case: I was using the diaeresis ad absurdum to pin down the wandering schwa to dead centre to posh it up a bit, since I was too ˈjæɫə to say the uncouth ˈjelə, (though I probably do, with the smoothing making it half-long or something), and ponce it up a bit as well, like Brüno. And since people have been chasing the wandering ʌ around on here recently, I make bold to say that if by /ˈjelə/ I meant someone who yells, I would say [ˈjelʌ]. We have had a good few unconventional transcriptions with it already, and being a dinosaur I do have a relatively back realization of schwa in that position. But not nearly so far back as to be a Noël Coward cartoon character! But to be perfectly honest, the canonical allophone of my /əʊ/ would be something like [ɛ̈ʊ]. Have a closer look this time (if that combo works at all). So if I do do any smoothing, it's perilously close to the pronunciation I was guying in a different context last 11 December: "It's sëː wɪːd that vɪəkl goes to vɪːkl but ˈvɪɪkl doesn’t, isn’t it?" Amy, you would expire of inanition before you succeeded in explaining THAT "joke" to your clients! > ˈmʌnde: Is that a shortened eɪ or an open ɪ? Another ambiguity: ˈsɪnju or even ˈsɪnjuː, and I think at a push ˈmʌnde or even ˈmʌndeɪ. With subsidiary stress, of course! I only meant the last one, with the unreduced eɪ. It does apply to the latter of the two sinews as well, of course. Because that is what I do, as part of the package that makes these strong forms possible at all. And I think you think it's what you do too. I've listened to your link again, and also to Jaques Brel singing the original. What I noticed instead was the first syllable -- even imagining that the vowel quality was strange. But of course the trouble is the illusion of accent created by singing it on the first beat of the bar. Substituting and calliopes may have been a neat translator's solution, but it would have worked much better with and on the first beat of the bar. Many people, at least in US, do indeed consider [ə] and [ʌ] as the same phoneme and unstressed vs stressed variants only. Ladies and gentlemen, the thummer. I abhor petitio principii, and I don’t think you will ever find me guilty of it. Certainly not here. As I have been saying, it is merely that for the purposes of descriptive adequacy we have to say the phenomena of long vowel and secondary stress co-occur in such speech. I have already suggested the test of trying to pronounce these long vowels _without_ secondary stress. It doesn’t work for us. Fanshawe is two phonotagms without the potential juncture phenomena of ˈFan ˌShaw. Is all. Actually, to the ears of some of us it seems that AmE typically has secondary stress on practically everything! The vowels don't have to be unreduced, they can be reduced or even potentially strong short vowels, and still sound to us as if they have secondary stress. When Americans get a fishing permit for fishing permit, I hear ˈperˌmit for the document and ˈpermit for the fish. We don't have that distinction. The OED doesn’t recognize it, but of course even American dictionaries would need to be pretty sophisticated to do so. But even one such consistent opposition has to be given some sort of phonological status. And there are others. Here is one which does work in BrE ˈmoonˌlit~ˈmoonlet. So yes, we can! > according to that definition "barrow" has a secondary stress on the second syllable except when it is pronounced as "Barra"
Well I hope you accept that it isn’t a definition, but you have already given us "yellow", and look at the fuss we have made about that! Did you not notice that "yellow" was the one word we agreed on not putting a secondary stress mark for the apparently unreduced form of, not even in brackets? "Barrow" maps onto exactly the same model for us. Lipman still hasn’t told us exactly what he was doing with [lo], even after he put it in square brackets. But Daniel Jones proposed [o] for reduced /oʊ/ in BrE, and although that has died out and we haven’t got a transcription convention for what we now have, I at any rate certainly have a much reduced /əʊ/ in November, and a slightly less reduced one in yellow, both of them without loss of diphthong status. You on the other hand have been talking (re prɪns/prɪnts on the Haiti thread) of ordered rules to get from morphology to phonetics as though they have something to do with phonology pure and simple. I'm sure that gives your co-religionists some solace, but you can't assume all of us here are of the same persuasion, and I'm afraid you're wasting your sweetness on the desert air with me. I am rabidly anti-TG and all the level-mixing that flows from it. It isn’t doable, and some of the rules you are trying to impose here are not working. Doing phonology and allophonics, morphology and allomorphics is made possible by strict delimitations of scope. They are on different ontological levels. I never paid attention, but I think I use all of yell[əʊ], yell[o] and yell[ə], depending on the word's stress in the phrase, and possibly on the following sound. Maybe even yel[w], which would be pretty Middle English, but really means dropping the schwa of [əʊ]. But really, I suspect that's what mny people do. In November (useful italics), I never pronounce a full [əʊ] but either schwa or [o]. I see I did not say that our yellows are obviously one phonotagm not two, and do not _call for_ a shouting match about unstressed long vowels! I meant to, because for many years I have held that such realizations can only be predicted on that assumption. Yelw it was (approx) in the beginning, is now, and ever shall be as long as I have anything to do with it! With the epenthetic voyelle du jour. Like all the other lw's dw's nw's and rw's etc. Not sure if anyone's still reading this thread (RSS feed? ), but I should like to add I tried to observe myself or experiment a bit, and I'm less than sure now that I really say yellw_V-. Do you subscribe to the RSS feeds? Do they work? They mostly don't for me. Then I noticed you can subscribe to email notification of continuing discussions, and they don't happen either. I have known them to on other sites! Yes, works fine in Opera, right into my regular e-mail inbox. I think the site gives you a choice between several kinds of Atom and RSS feeds. The one I use is http://phonetic-blog.blogspot.com/feeds/comments/default. This one's for the whole blog; I think you can also subscribe to the comments on each individual post. Many thanks to you both. So glad I asked. If you use Outlook Express some ISPs trash unfamiliar email without downloading it or telling you, and wipe it completely if you don't untrash them within a month. A month in my sight is like an evening gone, and I have been caught out that way before. BT sometimes even takes a dislike to familiar emails! I have kicked up about this, both on the telephone and online, but how far do you think I got? Anyway now posts to this blog will come directly into Outlook Express. The RSSs appear to be irreducibly erratic though. BT hardly knows if you're using Outlook Express, I think. Thanks again. I got that bt email! No sign of it on any of the RSSs, including yours of 11.36 this morning. But that does refresh a bit faster, although by 'erratic' I mean that they all refresh at random rates or not at all, even manually. So I'm not sure it's worth blundering around Firefox to try to reset the rate. What I do feel curious about is where you got yours of 11.36 from. I can't find it anywhere. Did you make it yourself? Forgot to comment on your first point. BT _doesn't_ know you're using Outlook Express, and I wouldn't expect it to, but don't you think it's not unreasonable to expect it to consider the possibility? Or to expect it not to expect you to use its own mailbox if you don't want your mail summarily trashed? Frankly, I don't quite understand what you mean. But anyway, mails and feeds are different things, only some mail programmes can list the feeds in the inbox among the e-mail messages. And the BT mail account can be accessed through the webmail interface as well as from an e-mail client such as Outlook Express, per POP3 or IMAP. Both might have a spam filter. You do understand what I mean. I was trying to explain that I tried subscribing to the mails because they are different things, and never expected any program to list the feeds in the inbox among the e-mail messages. What I did expect BT to do was to allow for the possibility that I might prefer to access my email through Outlook Express, and not to unilaterally decide what it would download to OE and what it would trash. And it was because you confirmed the email system was working that it did belatedly occur to me to access BT through the webmail interface as well as from Outlook Express, for which prompting I am unfeignedly thankful. Obviously Firefox is the culprit with the feeds. Haven't yet got round to resetting them as you suggested though.